Health care is at a crossroads and all players in the market basically want the same three things: Increased access to care, lower costs and better results. So plenty of companies are looking for innovations in new places — like startups companies. So DreamIt Health (an offshoot of Philly-based DreamIt Ventures) offers a select group of startups $50,000 in seed capital, coaching by hand-selected mentors, free workspace, legal counsel and access to resources in the health care space. The most recent DreamIt Health innovations were on display Monday at the Demo Day. 1. A smart mouthguard to analyze concussion risk: Concussions and head injuries are arguably the biggest issue in sports — leading to a generation of parents wary of letting their children play organized football or other contact sports. 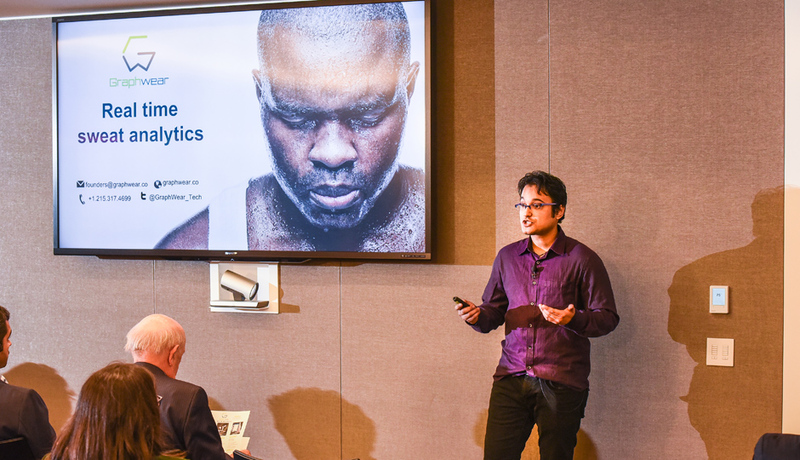 In response, Gray Matter Technologies has developed a smart mouthguard that transmits impact data to a mobile device using bluetooth technology. Co-Founder and CEO Tanner Avery knows the risk all too well. He got his first concussion playing high school football and suffered even more while playing collegiate rugby. Although Gray Matter estimates that there are 1.6 million to 3.8 million sports-related concussions per year, Avery says that 50 percent typically go undetected. For younger athletes, the coaches are typically just parents or volunteers who don’t have the medical training to properly diagnose concussions. If they use the smart mouthpiece, they’ll see head-injury data on an easy-to-read dashboard. The cost is $99, which includes the mouthguard, a portable case and a lifetime of data storage. The company is looking to raise a seed round of $250,000 to $500,000. 2. A patch that analyzes sweat: Sweating and losing fluids is just part of sports, so drink some water or Gatorade and get back on the field. Right? Saurabh Radhakrishnan has a much more scientific solution for athletes. His company Graphwear developed a patch that’s applied to the lower back (where you sweat the most) and analyzes sweat in real time. Data is sent to a smartphone via bluetooth to tell the user exactly when to drink water or other fluids. The patch uses an embedded graphene sensor and is targeted to high-intensity athletes. Radhakrishnan says football players lose 20 percent to 25 percent of their peak performance within the first 10 minutes of a game — and dehydration is a big factor. His target audience is the 500,000 NCAA athletes, 18 million race finishers and 7.8 million high school athletes in the United States. “Two out of three [high school athletes] show up to the games dehydrated,” he said. It costs $99 and replacement patches are 50 cents. The company wants to raise $750,000 to $1 million and hopes to integrate the technology into clothing. It also hopes to expand to other bodily fluids like ear wax and saliva. “Trust me, your ear wax has a lot of information about you,” he said. 3. A program to manage and reduce the cost of diabetes. For Sergey Sirotinin, watching his Uncle Vanya suffer with diabetes was difficult. Vanya lost his sight, had a heart attack and a stroke and eventually died about 10 years after his diagnosis. So he created dbaza health, a SaaS mobile solution that uses questionaries and proprietary algorithms to design a personalized plan for patient support. The goal is to build long-lasting self-management habits. It costs between $8 and $15 per month and the company is raising a seed round of $1.8 million to $2 million. 4. A wearable that tracks health conditions like epilepsy. Eric and Alex Dolan know the struggles of epilepsy all too well. Their mother has the condition, which showed them the importance of constantly monitoring the affliction to achieve better outcomes. But now with the advent of smartphones and smartwatches, they think there’s a better way. It hopes to start with epilepsy and move to other chronic and acute health conditions. The company hopes to raise $500,000 in a convertible note. 5. A personalized breast cancer risk assessment. Mahender Nathan argues that there’s no systematic way to assess and communicate individual breast cancer risk, so he created VixExcell — a personalized platform for radiologists and patients that applies machine learning and advanced computer vision to deliver risk models and automate physician annotation. “A mammogram looks backward to see if cancer has developed — not forward to see if it will develop,” said Nathan. Hoping to tap into the $10 billion annual spend for cancer screenings, VisExcell wants to raise $450,000. 6. An employee benefit solution to help navigate the confusing world of elder care. Anyone who’s cared for an elderly or sick loved one knows it’s hard work — especially while juggling a full-time job and raising a family of your own. So Elena Brennan created CareCierge — an employee-benefit platform that identifies care needs, develops action plans, provides on-demand experts and tracks service to manage ongoing care. The company is seeking to partner with companies with 500 or more employees, pricing the product at $1 to $3 per employee per month. CareCierge is not currently fundraising but will launch a campaign to raise $500,000 to $750,000 in the first quarter of 2016. The company is raising $1 million in a convertible note. 8. A software tool that fights cancer with data. “Data invades every other aspect of our lives, why shouldn’t it help improve cancer care?” asks David Lindsay, the co-founder and CEO of Oncora Medical. The company provides radiation oncologists with a web-based software platform. Lindsay says it will dramatically improve care by calling on historical patient data. It hopes to reduce the number of patients (55 percent) that suffer from significant toxicity to radiation. To do so, it integrates data from electronic medical records, radiation treatment images and patient outcomes. The company is raising a $1.2 million seed round and hopes to launch three paid pilots by January 2016.